I love love this rug! Safavieh makes the best rugs. I was debated on the titanium or sable. I'm so glad I chose the sable, it's the perfect blend. You can incorporate silver, gold and brown tones. I was redoing my color scheme and OMG this rug completed the look. I just love it and it feels so good! I'm not finished but I'm very close!!! Soft, plush and luxurious, Safavieh's Paris Shag Rug evokes the classic understated elegance and neutral color palette of French Moderne style. The drama of these rugs is in their lush opulent texture. Safavieh creates a flawless rug that is supple and silky to the touch and sure to add a touch of glamour to any living space. The rug is a mix of black and a sort of champaign color. When you step back, it looks almost like a light mushroom color. I would give it higher marks except it WILL NOT STOP SHEDDING. I bought 2 of these and they both lose strings like crazy. I am sweeping daily...and wonder how long it will take for the rug to 'go bald'. The bad part is - these are not high traffic rooms. 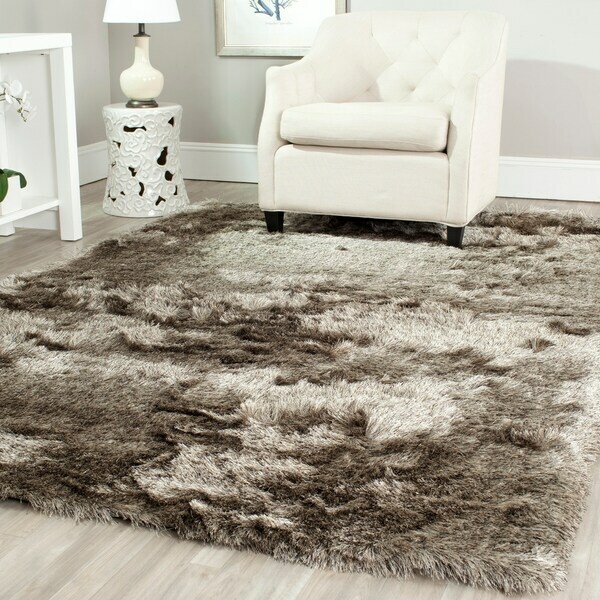 I bought another shag rug from Overstock (Titanium silver) and rarely see a string, and we are in that room constantly. 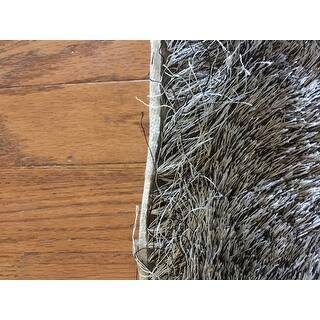 So it must be just this particular style/color because both of the rugs I bought in this color are having the shedding problem. This rug perfectly suited our needs, and is extremely smooth/soft. The rug was wrapped very well, almost too well as it took a while to fully unwrap it. I did have to lay a few items on one side of the rug to get it to lay flat, the other side was already flat. I kept the weights on the rug overnight and it was flat the next day. I deducted a star because the trim is very visible on one side of the rug. I've been brushing part of the faux fur over it daily to try to cover the trim, but not totally successful yet. The same side that had to be flattened is the side that has exposed trim. Also, as some other reviews mentioned, the rug isn't a solid color as it appears online. It's obviously cream and black when opened, but when you lay it out, the combination of the fibers give off the sable appearance. I've attached pictures showing both views, so you can see what I'm describing. Overall, I'm very happy with the purchase! 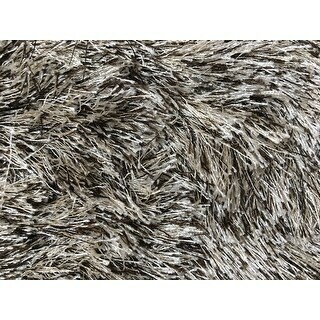 I have several of the Safavieh Paris Shag rugs in my home and I absolutely love them. Silky, smooth and gorgeous color in color. It is a very nice quality rug for the price you pay. It is a true shag, more stringy fibers than fluff so that's just preference. I would definitely recommend a rug pad though. So far, I have 9 rugs from them throughout my house ranging from larger area rugs to runners. I would definitely recommend. I’m really happy with this rug. It’s true that up close the fabrics are a combination of gold, black, cream, and brown which together make it a very beautiful golden grey sable. It’s essentially thread knotted at the base. It’s my favorite rug I own. I love shag rugs. I have a wool shag rug and it sheds so much the hair gets everywhere sometimes I even find it in my glass of water or my 3 year olds mouth. This rug has very little shedding. It’s plush, but not too high. I did buy the rug pad to go under this rug to make sure it was extra cushion-y. I love walking on it, and love the way it looks when the sun hits it. It does really feel like it’s description: silken glam. I will probably get another one at some point. The Glam Paris Shag Sable Brown Rug looks beautiful with my couch and living room decor. 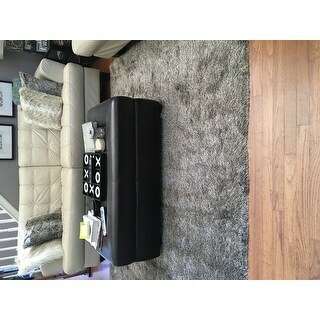 Made with great quality and would recommend this rug to anyone who wants style in their home. Very comfortable on the feet as well. Definitely a five out of five. 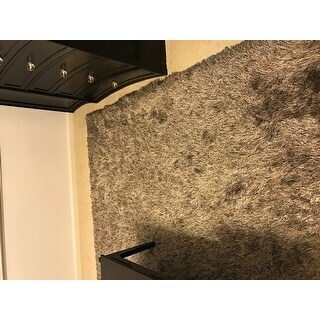 I ordered this rug in the sable color for my son's room after having first purchased the same rug in the ivory color for my formal living area. I love the look and feel of these rugs! They are quite thin so we partnered these rugs with rug pads. Although they are still not plush under foot, the feel of the shag is so nice that we hardly notice it. I have purchased many area rugs for our homes (too many, per my husband) and these Safavieh rugs are among my favorites! FINALLY..my perfect dining room rug. This rug is nicely made with colors of black, tan, pewter, ivory and browns, laying richly against each other to bring depth to any room. Happy customer..again by Safavieh Rugs. I'm overall pleased with the rug and will keep it, however- the color is not very brown at all, more black and white giving off a gray color but it will still work for me but I know some people are real picky about their color coordinating, also the rug is less plush than I envisioned you can feel the hard plastic that the rug is sewn into- I got a 1/2 jet plush rug pad to go underneath, but now I wish I had opted for a thicker one. Luxurious Rug for Fraction of the Price! Soft and very neutral. I was worried it would be too brown for my gray couch but that was not the case so it will definitely go with gray furniture if that is your dilemma. My dog (also gray) loves it. This rug is beautiful!! If you're thinking about getting it just know that it's high quality and the look is great. 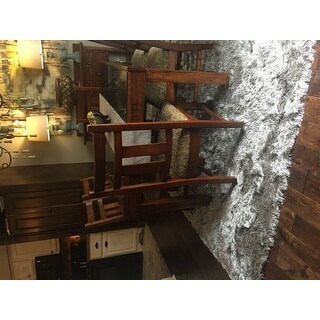 I wanted a similar rug from a high end store for more than triple the price. I'm glad I took the chance on this Overstock rug. It looks great in my bedroom. This rug is amazing! I love that it resembles fur. It's very soft under your feet. I wasn't sure about vacuuming it but it's very well made and has held up nicely. My pets love to lay on it. We use it in our living room on-top of our off-white carpet. Ordered this after seeing one at another home. Rug is beautiful. Not a solid color but a collection of grays and browns and when put together gives a glam, shimmery look. On its own, looks soft, but it’s not if placed directly on floor. We put a foam pad underneath to give it a nicer feel. Very comfortable for a nap! Overall, very happy with this product. 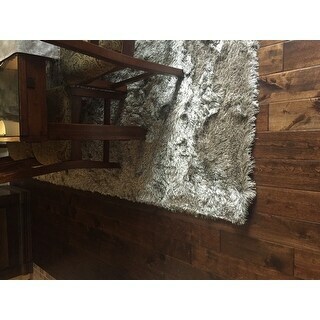 I liked the color and softness of this rug, The color is brownish with a hint of grey. The only problem is there are little thread pieces that always come off and the corners don't stay down. After reading some of the other reviews, I was a little bit nervous about ordering this rug. When it came, however, it was the exact shade of brown that I had hoped for, and it fit perfectly with my living room décor. Beautiful rug. Love how it feels. "Is it easy to move a coffee table around on this rug or is it too thick?" This rug has a pile height of 2.5 inches made from polyester. A coffee table should not have a problem being moved on this rug. "I would also like to know if it is more of a brown or a grey?" As stated in the title this is a brown rug. Please note that some colors may vary due to dye lot variation from production. "Would this match a distressed brown leather couch? 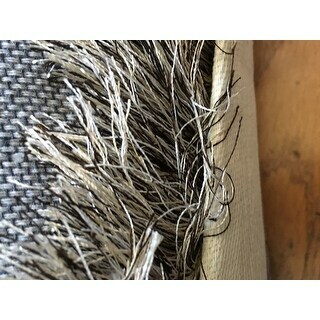 I can't tell if it is more tan brown or grey/silver"
We get tons of compliments on this rug. I think it is definitely more of a gray/silver than a tan. But, it comes off as very neutral overall, so it may work with your couch. i have two of them in the sable brown with a brown leather sofa and the color is perfect. I’d have to agree. 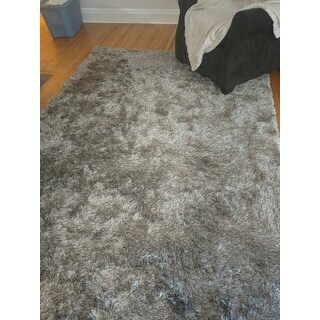 This particular rug is more of a grey/silver color. if you are looking to tie it in with a brown couch, I might suggest another shade. I do love the rug though! Hope this helps! I've had this rug now for 6 months and it has not shed. Holds up well actually. Very soft almost a silky feel when you walk barefoot on it. Very sleek look and comfortable as well. Highly recommend. "I have two dogs and really love this rug but am concerned about how to clean it if they were to vomit or pee ? 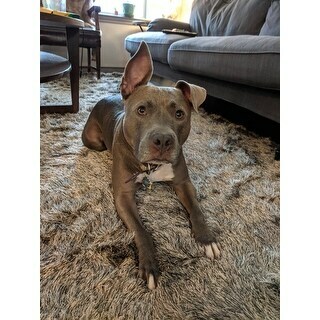 Is this rug a difficult option for pets? 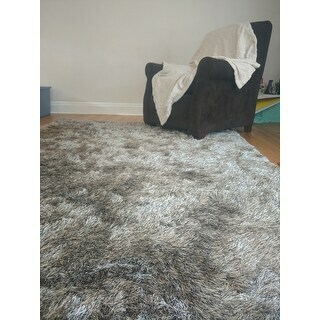 Thanks"
"Is this rug grey or brown? The reviews are all over the place. Some say it's grey, some black and white, some brown and beige. 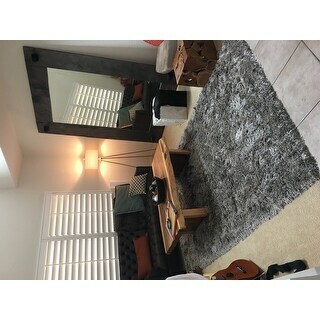 I'm looking for a rug that has browns, beiges (no grey). Please help? Grey or Brown/Beige? Pictures will help." No it is not, but it is really soft.